Dine on Shad, Visit the Shad Museum, Attend the Shad Derby, Cook Shad Recipes! It's a sure sign of spring when the shad are running in the Connecticut River. The American Shad (Alosa sapidissima) is Connecticut's official state fish. Each year, these fish (and American gizzard shad, pictured) swim from the salty sea up the Connecticut River to freshwater spawning grounds. Shad, like salmon, are anadromous fish: They ascend rivers from the sea for breeding. 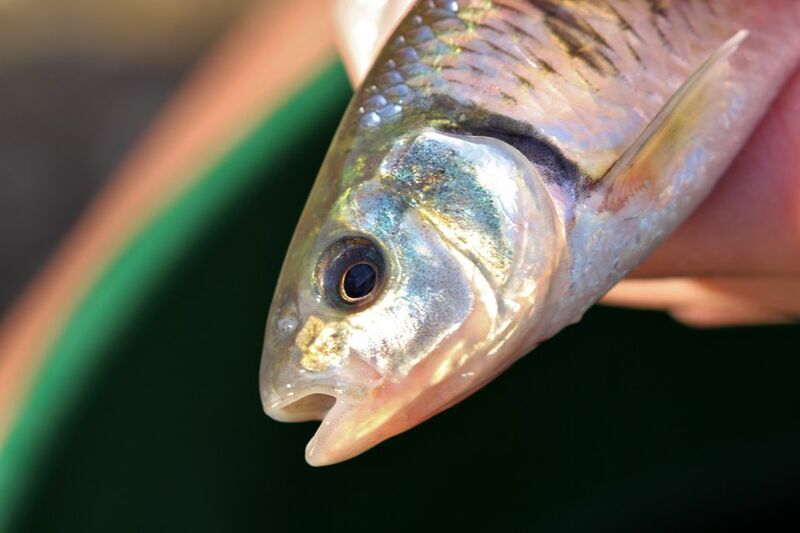 Shad are born and begin their lives in freshwater, migrate to saltwater for most of their lives, and then return to freshwater to mate after three to six years of saltwater living. Historically, shad was considered a "poor man's" food, but, as with other things that become rare, shad's reputation as a delicacy has increased as the annual catch has been reduced due to development and damming of the Connecticut River. According to the Connecticut Seafood Council, "One way to find some fresh shad and shad roe is to drive along the lower Connecticut River Valley between Middletown and Haddam on Route 154. Just watch for the signs, and you can find either fresh shad to take home and cook or a restaurant featuring this fish." And if you're really into shad, you'll want to plan a day trip to the Haddam Shad Museum: It's open Sundays from 10 a.m. until 3 p.m. from mid-April through the end of June and at other times during the year by appointment. The museum is at 212 Saybrook Road, Higganum, Connecticut. Call 860-267-0388 for more information and to confirm hours of operation before you go. Admission is free. Windsor, Connecticut's Shad Derby Festival on the Green is a family favorite. Official slogan: The Shad Always Return. This year's 65th annual festival will be held Saturday, May 18, 2019 from 9 a.m. to 4 p.m. The day of events features food, crafts, family activities, live entertainment and a free parade where you can see the Shad Derby Queen! The parade steps off at 11:30 a.m. For more parade information, contact the Windsor Jaycees via email at parade@windsorjaycees.com. Other Shad Derby-related events scheduled in Windsor for additional dates in April and May typically include Shad Derby Trivia Night (date TBA), Family Fishing Night (date TBA), the Youth Fishing Derby (date TBA), a Golf Tournament (date TBA) and the Shad Derby Outdoor Movie Night (date TBA). Make plans, too, to enjoy shad at the Essex Rotary Club's 61st annual Shad Bake. Although the 2019 date and details have not yet been announced, this tasty tradition is typically scheduled for the first Saturday in June and held on the grounds of the Connecticut River Museum in Essex, Connecticut. Tickets were $30 for adults, $10 for children under 10 in 2018, and when they become available for 2019, they can be purchased online in advance. Food is typically served from 3 to 6 p.m. There is also usually live music and a cash bar. These photos will have you craving the seasoned shad cooked on oak planks at this old-fashioned outdoor fish bake. Baked Shad Recipe - This vintage baked shad recipe dates to 1914. Baked Shad Roe with Tomato Sauce - This historic recipe is from The Boston Cooking-school Cook Book by Fannie Merritt Farmer, published in 1918. Broiled Shad with Herbs & Onions - This shad recipe features the flavors of onion, lemon, paprika and thyme. Fried Shad Roe - This historic recipe is from The Boston Cooking-school Cook Book by Fannie Merritt Farmer, published in 1918. Grilled Shad - It only takes 10-15 minutes to prepare shad on the grill with this recipe originally from the New York Seafood Council. Morrocan Shad With Fava Beans - Add Middle Eastern flavor to your Connecticut River shad with this recipe adapted from Nicole Amsellem and published by the New York Times. Recipe for Basic Broiled Shad - An easy-to-prepare recipe for shad fillets. Shad Roe with Bacon - Add zing to shad roe with this classic recipe featuring bacon and flavorful herbs. Six-Hour Baked Shad with Onions and Bacon - Slow cook your shad with this recipe from cookbook author and publisher Jay Harlow.